Like Colorco's Block Lettering, our Designer Lettering is suited for a variety of Floral, Gift-Wrap, and Craft Design Ideas. Lettering fonts and styles play an important part in communication and artistic expression of thoughts and ideas. If you're intended look requires a more stylish and unique design, our Chapel, Funfont, Serif, or Tri-Letters will definitely provide you with just the right alternative that you're looking for. 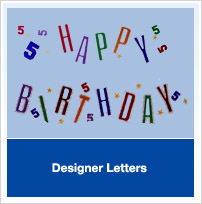 See our full line by clicking, Our Products, Designer Lettering, Product listed in submenu.